Whatever your point of entry, here is the complete fullhyd.com guide to make sure you know what to do without getting confused, insecure, tired or cheated. 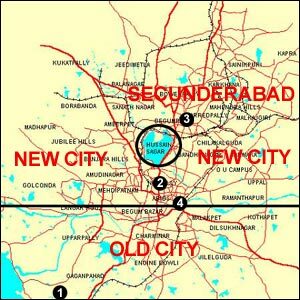 A quick understanding of the topography will help a lot if you are new to the twin cities of Hyderabad and Secunderabad. Think a horizontal line and a circle slightly above it - or just look at the summary map alongside where they're drawn. The horizontal line is the river Musi, and the circle is the lake Hussain Sagar. Below the river Musi is what is called the old city - the original Hyderabad with most of the city's popular monuments. Above the river Musi is also Hyderabad, until the top of that lake. Above the top of that lake is Secunderabad. 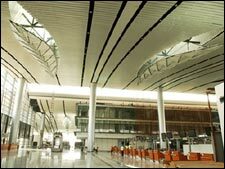 The Hyderabad airport, located centrally in Begumpet until March 2008, shifted 30km (18 miles) south of the city to Shamshabad. See the small black circle marked 1 in the map. That's not the airport - it's much lower than that, about as far below the map as the distance of this mark from the horizontal line. The airport is certainly much bigger (5,000+ acres) and far classier now, but it also means a 1-hour drive into the city. If you are here on business, it is quite likely to be at Begumpet, Banjara Hills or Madhapur/Gachibowli. You can try spotting these on the map - Banjara Hills is below the large red "New City" on the left, Madhapur is above it and Begumpet is under the black circle marked 2. Shamshabad is far outside Hyderabad, but the connectivity is likely to be quite good by the time you read this. There are airport shuttle coaches (buses) that cost Rs. 200 per one-way trip, and pickup/drop is at 9 places (Secunderabad, Secretariat, Masab Tank, Kukatpally, Hitech City, L B Nagar, Begumpet, Tarnaka and Uppal). There are also car rental services - by Carzonrent and Akbar Travels. The airport of course has radio taxis and pre-paid taxis plying, and these charge Rs. 18 a kilometer (1 mile = 1.6 kilometers). So expect a bill of Rs. 600 ($12 at a conversion rate of Rs. 50 to a dollar) if you work needs you to come to Banjara Hills, and another Rs. 250 ($5) if you need to go to Madhapur. Details are at the same link above. Most of the bigger hotels will arrange for cars/taxis to take you around, so check for airport shuttle services with the hotel you have booked into. The Hyderabad railway station is much more centrally located (black circle marked 2), and has plenty of budget hotels around. If you are entering Hyderabad from here, you will encounter licensed porters first who will in all probability charge you more to carry 30kg to the entracnce of the station from your compartment than it will cost you to reahc home after that. If you cannot carry your luggage yourself, negotiate hard, for there are no fixed prices here. Once out, you will most likely look for a prepaid taxi or an auto-rickshaw. Prepaid taxis charge about Rs. 18 a km, and auto-rickshaws about Rs. 8. For pre-paid taxis you pay at a counter at the station based on the distance, and just give a copy of the receipt to the driver of the car you have got into, once you get off. And if you are planning to take an auto-rickshaw, you will find a traffic police manned queue for auto-rickshaws that you should stand in. In Hyderabad, you pay exactly the reading on the meter to auto-rickshaw drivers, and about 50% more between 11pm and 5am (the driver will have a conversion card for late nights which you should ask to see). Auto-rickshaw drivers in Hyderabad at not necessarily the most honest or the most cordial persons. Many can give you an unsolicited tour of the city to enhance the meter reading if they get the slightest suspicion you are naive. You need to be firm if they ask for fares above the meter reading - it's illegal for them to ask that. You can call the cops at 23234065 (or 100) to complain about errant or abusive auto-rickshaw drivers. 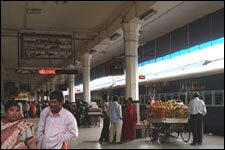 There is a local train service in Hyderabad (MMTS) that has a stop at the Nampally station (you may need to change platforms). There is a list of stations at the bottom of this article. That's a pretty good option if you do not have too much luggage and are looking to save money. MMTS trains are not very frequent, so you can also look at the bus stop about 100m from the station which has a constant stream of public transport buses. 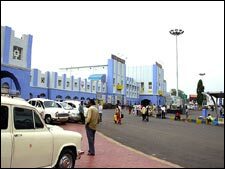 The Secunderabad railway station is much bigger than the Nampally railway station, and fast turning sleek, being the headquarters of the region for the railways. Everything else above holds - just everything. The black circle marked 3 in the map is where the station is located. The black circle marked 4 in the map is where Hyderabad's central bus station is located. You are most likely to be getting off here if you are coming in from outside Hyderabad on a bus. There are bus stops outside where you get buses to almost any part of town. Please read the Nampally Railway Station section for any other tips. The Andhra Pradesh Travel & Tourism Development Corporation conducts daily sightseeing tours of the twin cities. For information call telephone numbers 23453086/23453036/27816375. To find taxi services / cabs, please click here. i am new to Hyderabad, please help me to find out the hostels/hotels at nearest hi-tech city to stay for a week untill i find a room. Sir please convey me to how i reach Gochobolli (IIIT) from Airport. Thanks for the information. Its really helpful for me since I am new to Hyderabad! fullhyd.com has 700,000+ monthly visits. Tell Hyderabad what you feel about Arrival In Hyderabad!